Be the first to share your favorite memory, photo or story of Neal. This memorial page is dedicated for family, friends and future generations to celebrate the life of their loved one. 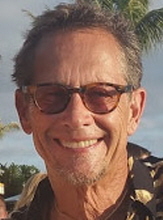 Neal Arthur Alexander, 60 passed away on March 12, 2019 in Englewood, Colorado. Neal was born in Jackson, Mississippi on June 3, 1958. He is survived by Karin, his wife of 37 years, his daughters, Chelsea Willis (Emerson) and Chloe Nelson (Jaymes) and his grandchildren, Makena Willis, Westin Willis, and Archer Nelson. Neal is also survived by his siblings Alicia Nilsson, Robert, Paul, Sarah Staebell, Nelson, David, and Grant. He is preceded in death by his parents, Russell and Aldea Alexander and siblings, Carl and Mary Alice. To send flowers or a remembrance gift to the family of Neal Arthur Alexander, please visit our Tribute Store. Services conclude at the Chapel. "Email Address" would like to share the life celebration of Neal Arthur Alexander. Click on the "link" to go to share a favorite memory or leave a condolence message for the family.